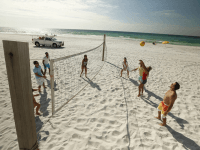 There are many reasons why Hilton Sandestin Golf Resort & Spa is an ideal place to spend a Gulf Coast vacation — one being its proximity to places like scenic route 30A. This beautiful coastal drive passes through a string of unique beach towns including the beautiful Alys Beach, FL. Nestled between Seacrest and Rosemary Beach, Alys Beach, FL is a New Urbanist community made almost entirely of white stucco buildings. Inspired by the elegant architecture of Bermuda, each building is stylish on its own, and viewed as a whole, the town is striking. Alys Beach’s walkable design and abundant common spaces invite visitors to explore the town with awe at every turn. One great way to get around is by bicycle. Two- three- and four-wheelers are available for rent at the Alys Beach Bike Shop. Peddle the streets, wind through Alys’ 20-acre nature preserve or cruise along the coast on the bike path that connects 30A’s communities. When you’re ready to eat, local hangout Fonville Press serves up light breakfasts and lunches with coffee and wine on the menu. For something a little more substantial, George’s offers upscale coastal cuisine in a casual setting. For a truly elegant dining experience, try Caliza Restaurant. Perhaps Alys Beach’s most celebrated institution, Caliza Restaurant overlooks a tranquil saltwater pool, where soft lighting and Emerald coast breezes create a relaxing, romantic atmosphere. Not to be outmatched, the food is also exquisite. Using fresh, local ingredients, the chef creates contemporary American fare with bold flavors that let the ingredients shine. The restaurant’s drinks menu includes signature cocktails designed for poolside sipping and the desserts are a worthy finish to any meal. After lunch or before dinner, Alys Shoppe is the place for women’s and men’s fashions, handmade jewelry and more. 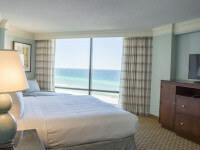 It’s a must visit during your Gulf Coast vacation. Also be sure to check out the town’s calendar to find out about special events during your visit like the popular art festival, Digital Graffiti. Part party, part community event and 100 percent art extravaganza, Digital Graffiti is a highlight of the South Walton calendar. This hi-tech nighttime festival, held over a weekend in mid- to late May, features art created with light projected onto the canvases of Alys Beach’s pristine white buildings. If you’ve never been to Alys Beach before, show up before sunset so you can fully appreciate the transformation. 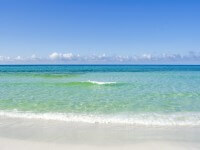 Visit Alys Beach, FL during your next Gulf Coast vacation at Hilton Sandestin Beach Golf Resort & Spa.